The Dino Skeleton with base would make a great addition for your Jurassic display or for using as an educational learning tool. This Dino Skeleton with base would be ideal to use as a finishing touch in a pre-historic themed child's bedroom, museums, leisure parks, attractions and theme parks. 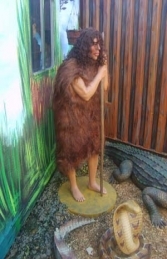 Why not add one of our other fossil models to complete your pre-historic Dinosaur and Jurassic theme.This model is ideal for all businesses, pubs, restaurants, coffee shops, adventure golf courses, children’s farm’s, zoo’s, theme parks etc or this would even look fabulous in your own home or garden.